Growing up, I loved the opening to ABC’s “Wild World of Sports”. There was something about the iconic sound of Jim McKay’s voice coupled with indelible and contrasting images of the 1980 U.S. hockey team winning gold and Vinko Bogataj’s 1970s ski-jump crash. The thrill of victory … and the agony of defeat became part of sports lexicon in the 1970s and 80s, even if “Wild World of Sports” became a bit obscure for mainstream fans. History has shown sports is one of the few settings where the difference between winning and losing can be a few inches, running the ball instead of passing it, or a little fresh snow on a ski jump. And unlike during “Wide World” days, the way athletes and teams handle winning and losing today is on full, 24-hour display thanks to social media. Two examples (one obvious, one maybe not as much) caught my eye this week. I don’t work in sports, but my day job connects me to the industry, and I’m fortunate to know many who represent teams, leagues or athletes. The overwhelming sentiment is social media is a much friendlier, easier space to navigate when teams are winning than when they’re losing. So after falling to the New England Patriots on the biggest stage in sports, and in utterly heart-breaking fashion, the Seattle Seahawks did not go away quietly on social media. No sulking. No pouting. No self-doubt. The team instead used its various social media platforms with class. It chose to to trumpet a season many would consider disappointing, given the way it ended. Seattle did what it had done all year through social media: Offering a good product for its fans with unique access only it could provide. Despite being trampled by one of toughest losses in recent sports memory, the Seahawks rose above potential fan backlash that accompanies loss. The team soldiered on and did their jobs, despite the agony that must have clouded every move. In fact, judging by some of the team’s Twitter mentions and Facebook comments, it likely inflicted an additional emotional toll on many — from those running the social show, to the players, all the way to the front office. The social media strategy around losing in sports is not something easily tackled — or often discussed. Defeat invites fan anger, negativity, even apathy. (Trust me, I’m a suffering Iowa Hawkeyes football fan who understands fan apathy all too well.) In the face of loss, some sports industry pros take a crisis communications approach, offering little or no additional commentary. It’s easier — and perhaps better for all involved — to say nothing in social media. I think that’s wrong. Defeat is part of sports. It is victory’s antagonist and is the stuff that makes winning so thrilling. Win or lose, fans crave the information and insight teams can share in social media. Yes, traditional media will always be there to recap the X’s and O’s, but teams can direct the conversation toward fan-centric topics, toward that next great thrill. 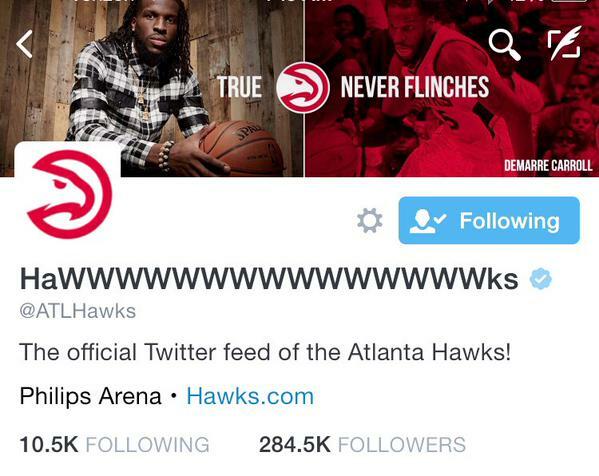 During its 19-game win streak, the Atlanta Hawks updated the team Twitter name to highlight each new win. The NBA’s Atlanta Hawks dealt with a tough loss this week, too. The team’s incredible 19-game winning streak came to an end Feb. 2. The Hawks found new and innovative ways to engage with fans around this truly thrilling run. I especially enjoyed the team’s creative use of its Twitter handle, adding W’s for every additional win … until the team ran out of characters. The streak was a serendipitous exclamation point on a re-branding effort the team underwent during the off-season. It’s paid off — in wins on and off the court. Attendance is up more than 12 percent over 2013-14 numbers, and the Hawks have a revitalized social media presence highlighted by the streak. Like all winning streaks, this one came to an end. And the Hawks did not disappoint, despite the loss. The team’s social media crew created a custom Spotify play list thanking fans for their support during the streak. It was a creative climax to a truly historic run, and is easily my favorite piece of sports + social media content of 2015 to date. How would you like your favorite teams to deal with winning and losing? Everyone could learn a little something from Seattle and Atlanta. Great post, Tom! Fans can appreciate emotion exuding from the team, knowing the players and organization care as much as the fans do. Affinity and fan ties can even be reinforced in humble, but admirable defeat.